A new #Ishipit to add to my list? Jamie and Claire from Outlander. Still pretty new to the show, I LOVE how finally we have a woman in charge in a historical romance. She has so many, many things to teach him (cue waggling of the eyebrows). #Ishipit in secret? Jon and Daenerys from Game of Thrones. Pretending I know nothing about their lineage, there’s noting sexier than a man not intimidated by a goal-driven woman. 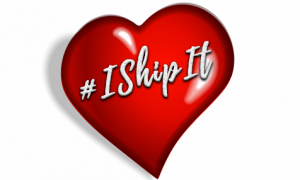 #Ishipit because it’s realistic about love triangles? Ross and Demezla from Poldark because they prove love is always messy but sometimes worth it. #Ishipit because who doesn’t love turning a fairytale on it’s head? Princess Buttercup and Wesley from Princess Bride. #Ishipit because real life fairytales do exist? Kate and William! Why should you ship ROYAL ATTRACTION’s Alexandra and Oliver? They’ve been best friends since childhood, and who doesn’t love a good friends to lovers story? They’re competitive in ALL areas of their lives….if you catch my meaning. Because the couple that causes a international scandal together, stays together.